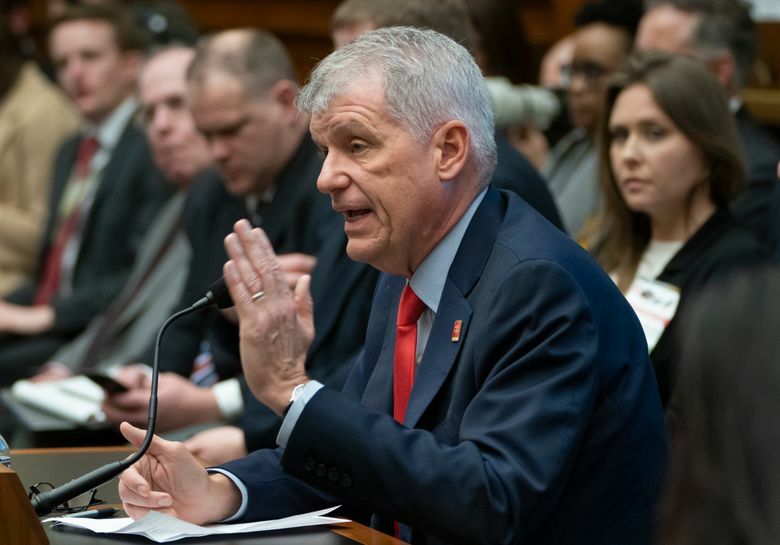 The confrontation with lawmakers underscored how far Wells Fargo has yet to go to win back the public 30 months after it was fined for opening millions of bogus accounts for consumers. The bank has been working to address widespread abuses that have made it a target for both major parties and President Donald Trump, dragging on its stock and prompting the Federal Reserve to impose an unprecedented ban on growth. Meanwhile, lawmakers suggested regulators and other authorities should be harder on the firm, potentially forcing out more executives or bringing criminal charges. They demanded the company do more to make customers whole and advocated stiffer rules for the entire industry. Brad Sherman, another California Democrat, yelled at Sloan to end forced arbitration and support overdraft-protection legislation. Tensions also flared as Democrats including Carolyn Maloney of New York and Ayanna Pressley of Massachusetts demanded Wells Fargo stop providing financial services to the National Rifle Association and firearms companies. “Why does Wells Fargo continue to put companies over people?” Maloney asked, saying the gun industry is “literally killing” children. “We don’t put profits over people,” Sloan responded. He said it isn’t up to banks to enforce legislation that doesn’t exist. Criticism of Wells Fargo came from so many that Kentucky Republican Andy Barr opened his questions by expressing surprise: “I’m shocked that you’re not in an orange suit and little jail cell today.” That drew gasps in the room before he went on to argue against dissolving the bank, instead giving executives a chance to fix problems. “The issue within the institution was not a matter of size, it was a matter of culture,” Barr said. Sloan, who took the helm weeks after the first scandal emerged in September 2016, remained calm as he fielded questions. He argued the San Francisco-based lender isn’t too big to manage and categorically denied assertions in a New York Times article over the weekend. That report cited Wells Fargo employees who said its culture hasn’t changed and that misaligned sales incentives still exist. The assertions “are just wrong,” Sloan said. “It’s my job as CEO to make sure things change and they are changing,” Sloan said. He said repeatedly that, although he can’t promise perfection, he’s the right person to lead the company and that it’s getting better. The board has credited him for rooting out and fixing past problems, addressing regulators’ concerns, tightening internal oversight and taking other steps to improve earnings. Sloan is the first head of a major U.S. bank to appear before the House committee since Democrats assumed control of the chamber in January. They’re planning a series of sessions this year to examine big banks and may call in other CEOs in coming months. Wells Fargo’s scandals have been wide-ranging and costly. Following the revelation that employees opened millions of accounts without customers’ permission to meet sales goals, issues have emerged in consumer-lending, wholesale and wealth-management units. The company forced unnecessary insurance policies on auto-lending customers, charged borrowers improper fees to lock in mortgage rates and foreclosed on struggling homebuyers who could have had debts modified. Last year, the bank paid $1 billion to federal regulators to settle allegations it mistreated consumers. In December, it settled with 50 states and the District of Columbia for $575 million. The abuses led the Fed to bar the bank from growing total assets beyond their level at the end of 2017 until lapses are fully addressed. Waters ended the session with a promise to reintroduce legislation aimed at holding big banks accountable, which would, among other things, give regulators the authority to break up lenders that abuse consumers. Patrick McHenry, the top Republican on the committee, acknowledged that Sloan has made some progress, but expressed concern that the Fed and the OCC still don’t seem comfortable with measures taken so far. With assistance from Michelle Kim and Gregory Mott.